Layton Kanistanaux, head, white, male, b. Aug-1833, 66, married 45 years, he and both parents born in NY, day laborer, he can read, write, & speak English, he owns his house and property free and clear. 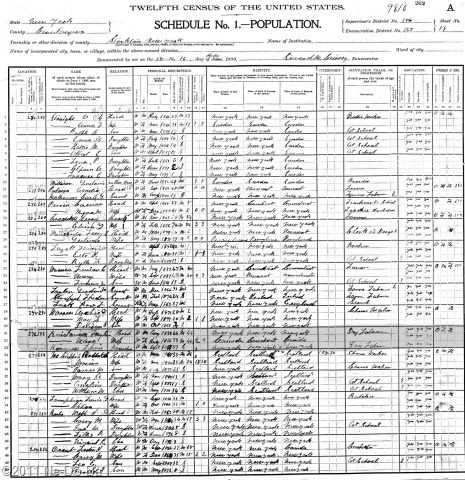 The census taker does not record the property as a “farm”. Mary Kanistanaux, wife, white, female, b. Jul-1826, 73, married 45 years, she is the mother of 4 children all still living, she and her mother born in Canada and her father is born in CT, she can read, write, & speak English. Lewis Kineness, boarder, white, male, b. Apr-18__, 59, single, he and both parents born in NY, day laborer, he does not read, write, or speak English. I see no big surprises with Layton and his wife. She is again called Mary (I really need to verify this is not a new wife) and older than Layton. They are both listed as “white” but that is to be expected. The longer a Native family lives away from a Native community the more likely they are to be seen as members of the white community they live in, especially if they are not engaged in any “Indian” activities or occupations. I see no mention of Doctors here. Layton owns his property free of a mortgage. Finding his land records should be high on my to-do list. Layton & Mary claim they have been married for 45 years which would put the marriage somewhere around 1855. This helps to confirm that Mary and Marleah are the same person. It also gives me a time period to search for their marriage record. Marleah says she is the mother of 4 children, all of whom are still living. So far I have collected the names of 3 children from census records and probably the fourth from the death record of Henry. Her children should be Carrie, Henry, William, and Lee O Nette. Now, who is this boarder living with them? Sometimes boarders are just that, but frequently they are relatives. This man is a few years younger than Layton. He and his parents are listed as born in New York, yet he does not speak English after living in the U.S. for more than 50 years. I find that rather curious. Although he is listed as “white”, I suspect he is Native. He will be high on my list of people to research further to see if there is a connection to Layton or Marleah.